Iran is one of the world’s most mountainous countries, its landscape is dominated by rugged mountain ranges separating various basins from one another. The main ranges are the Zagros and Alborz Mountains. Alborz mountains (also Alburz, Elburz or Elborz) in northern Iran stretch from the border of Azerbaijan along the western and entire southern coast of the Caspian Sea and finally run northeast and merge into the Aladagh Mountains. The Central Alborz (the Alborz Mountains in the strictest sense with many peaks exceeding 3000 meters (9,843 ft) or even 4000 m 13,123 ft) runs from west to east along the entire southern coast of the Caspian Sea. 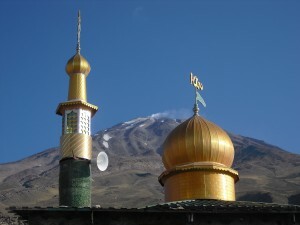 The Central Alborz contains Iran’s highest point, Mount Damavand at 5,670 m (18,602 ft), which is also the highest mountain in the Middle East and on the Eurasian landmass west of the Hindu Kush. You will find in Iran a great variety of wild landscapes and mountains allover the country. Mount Damāvand (35 °North, 52 ° East), a potentially active volcano (dormant volcano), is a stratovolcano and the highest volcano in Asia. Located only 60 kilometres from Caspian Sea (and 66 kilometres from the capital Teheran, with 8.3 million inhabitants and 14 million in the wider metropolitan area), it is one of the highest freestanding mountains in the world and is characterized by an outstanding beauty. Mount Damavand first erupted in the Pleistocene almost 1.78 million years ago. After several known eruptions around 600,000 and 280,000 years ago, it finally erupted about 7300 years ago in the Holocene. Its steep cone is formed of ash and lava flows that are mainly made of trachyte, andesite and basalt. The volcano is crowned by a small crater with sulfuric deposits. There are also fumaroles, hot springs, and mineral deposits of travertine. Large fumaroles near the summit crater emitting sulfur demonstrate the ongoing volcanic activity. Damavand has a special place in Persian mythology. In Zoroastrian texts and mythology, the three-headed dragon Aži Dahāka was chained in Mount Damāvand, there to remain until the end of the world. In a later version of the same legend, the tyrant Zahhāk was also chained in a cave somewhere in Mount Damāvand after being defeated. Being Iran’s pinnacle and landmark, it is the symbol of Iranian resistance against despotism and foreign rule in Persian poetry and literature. Therefore Damavand is registered as a national natural heritage and there are discussions to registered it as a UNESCO international natural heritage. Because of his beauty, height, interesting geology and wildlife Damavand is a fine destination for climbers from Iran and from allover the world. There are at least 16 known routes to the summit of various difficulties. Some of them are very dangerous and require rock climbing. The most popular route is the Southern Route which has steep ramps and a midway camp called Bargah Sevom Camp/Shelter at 4220 m (about 13,845 ft). With good weather conditions this route is more or less easy, but needs a good adaptation to height. A risk is also the big sulfur cloud coming up near to the top; breathing can be difficult. 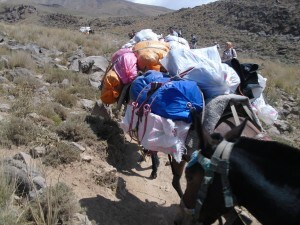 Tourism is increasing in the region and provides some income (for example to the guides, to the horse owners, because horses carry the baggage, etc.). 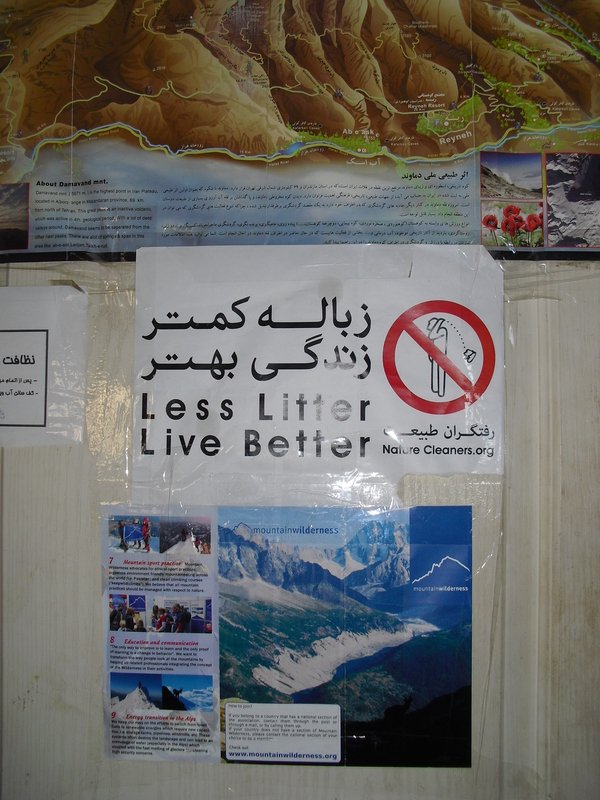 Unfortunately – as in other fascinating sites – people don’t care about nature, they throw their empty plastic bottles away and leave also other garbage behind, even though there are clear signage calling to keep clean the nature . It was expected to be ever present for generations. Regrettably, Damavand Mountain has long experienced negligence, abuse, over utilization, intentional and unintentional destruction, some of them non-restorable. Worried mountaineers and Damavand Mountain friends found it necessary to form the Damavand Mountain Protectors Society as a non-profit non-governmental organization. This society has the mission to help bring Damavand Mountain’s natural environment to the international standards level and to upgrade this society to “Damavand Mountain National Foundation” with the help and cooperation provided by all Damavand friends. The celebration of a “National Damavand Day” advocates for its protection. Many efforts have gone into achieving these objectives. A search through internet for “Damavand National Day” introduces interested users to past activities. Iranian Mountaineers Society has been involved in and has been on the forefront of many activities including working on the initial idea, making a proposal, and following up for selecting a Friday close to 13th of Tir (4th of July) as “Damavand National Day” from 1384-88 (2005-2009). Other activities include: organizing meetings with conferences, safeguarding the famous Poppy Fields at the bottom of Damavand, correspondence and following up on legal aspects of national registration of Damavand Mountain, promoting its protection, and continual mass media publicity. The formation of Damavand Mountain Protectors Society in Aban 1388 (November 2009) was the result of those efforts and opened a new chapter. 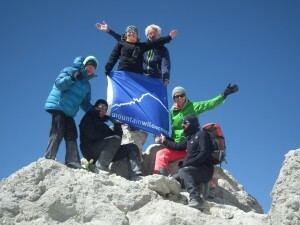 Gotlind Blechschmidt from MW International had the opportunity to visit Iran and to climb Damavand in September 2014. On the way up she met a group collecting rubbish along the whole Southern Route. The Amol Damavand protectors group (another name: Nisha, which means “bud”), coming from a city north of Damavand, Amol, is working for free in this field every summer. Their work is not limited to mountains, but they are active also in the woods next to the roads. The Amol Climbing Federation was the sponsor. About 100 volunteers (and not all of them were mountaineers!) collected the tourists garbage and brought them down in big plastic bags … In 2014 they hold their 16th action! 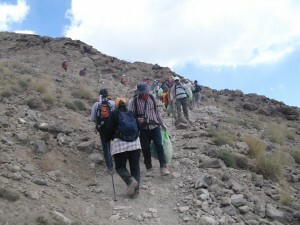 There are other groups too gathering rubbish at Damavand, but most of them do it in conjunction with climbing while Nisha’s main action is the yearly cleaning work and not climbing. Gotlind said: “I met a clean mountain with its great beauty and its wide overview of Iran … Only ten plastic bottles were left over and I collected them.” And she repeats the slogan written in the hut: “Less litter, live better.” Let’s keep the mountains clean! Come to Iran, come to Damavand, enjoy the mountains and the people of Iran!